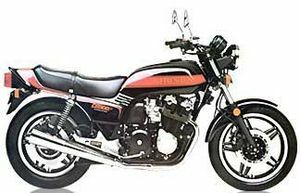 The Honda CB900F is a motorcycle produced by Honda from 1981 to 2007. 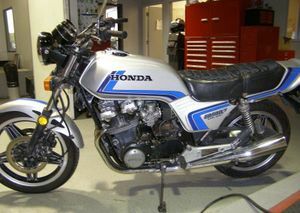 A Honda 919 from the United States. 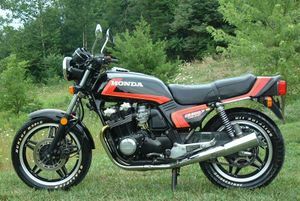 The CB900F first appeared in 1980 as Honda’s latest foray into the ever-increasing naked muscle bike market. 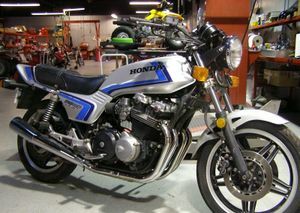 The machine took styling cues from its bigger brother, the Honda CBX1000, and used a power plant derived from the company’s then revolutionary CB750KZ. 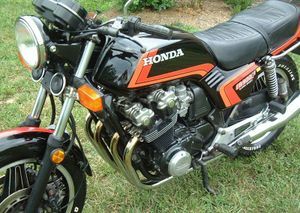 The Honda CB900F (also called the 919 in the US and Hornet in Europe) is a "standard" or "naked" style motorcycle based on a sport bike engine but with a more upright seating position and revised engine and gearing, providing performance and comfort between a typical sport bike and a cruiser. 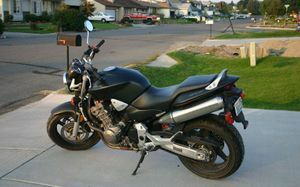 It was introduced in 2000 and its last model year was 2007. 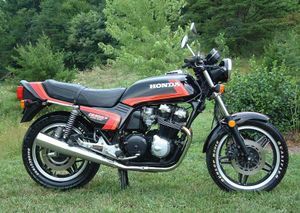 It was replaced by the Honda CB1000R. 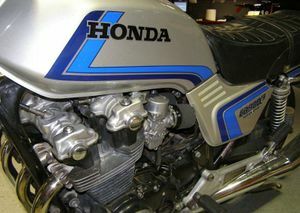 The CB900F is powered by a retuned Honda CBR900RR engine, developed by Tadao Baba, one of Honda's Large Project Leaders. 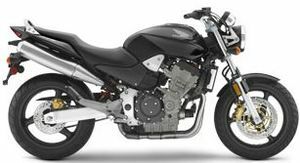 The motor is a transversely mounted, liquid-cooled, fuel-injected 919 cc (56.1 cu in) in-line 4-stroke 4-cylinder DOHC engine that produces around 100 hp (75 kW). The engine utilizes cast camshafts and pistons instead of the pricier forged items. 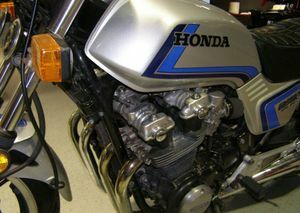 For greater midrange punch, the CB900F's camshaft profiles are milder and compression is slightly lowered. 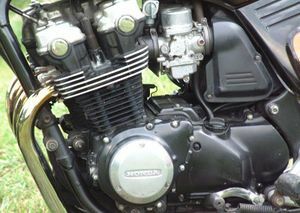 Four 36 mm (1.4 in) fuel-injection throttle bodies take the place of the CBR900RR's 38 mm (1.5 in) carburetors. 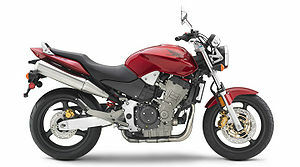 Redline happens at a 9,500 rpm and the bike has a six-speed transmission. 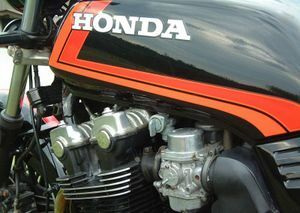 The 901cc 16-valve motor was deemed one of the smoothest engines available at the time of its release. 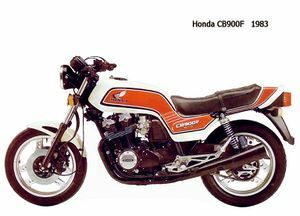 It produced a respectable 95bhp at the crank, which was transmitted through chain final drive via the Honda’s 5-speed gearbox. A steel, square-tube backbone frame supports the engine as a stressed member. 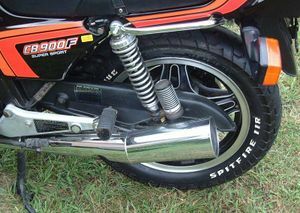 In front, a cartridge fork (adjustable beginning in 2004) guides the wheel, while a single shock, adjustable only for preload,(& rebound dampening beginning in 2004) connects with the aluminum swingarm and carries the weight in back. Its brakes are dual-disc in the front and single-disc in the rear. 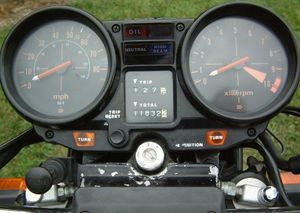 Instrumentation consists of an analog speedometer and tachometer and basic indicator lamps, incorporated under a tinted window, and a single trip meter. 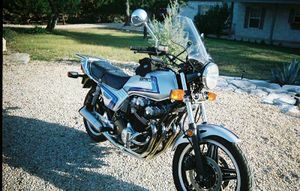 While the CB900F comes sans center stand, one is offered as an accessory for 49-state models, although it can be fitted to a California model. 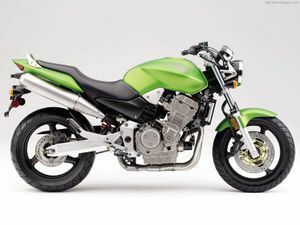 The bike's rake is 25°, trail is 98 mm (3.9 in), wheelbase is 1460 mm (57.5 in), and seat height is 800 mm (31.5 in). It has a tested dry weight (minus fuel only) of 455 lb (206 kg) and a tested wet weight of 485 lb (220 kg). 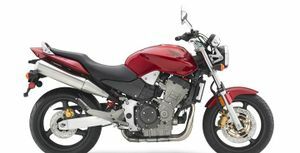 Air-assisted 39mm front forks and remote-reservoir shocks were fitted in an attempt to improve the machine’s handling over its predecessors. 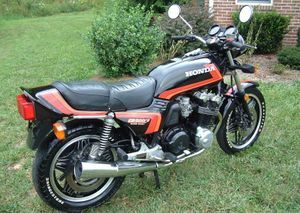 Sadly, the Honda handles no better than most 1980s muscle bikes. 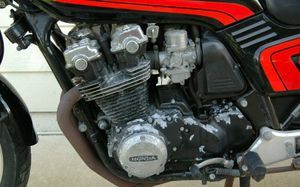 The engine is also prone to premature cam chain wear. 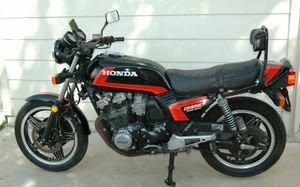 Honda has had a CB900 model since 1980 in North America and an even earlier CB900F model in Europe. 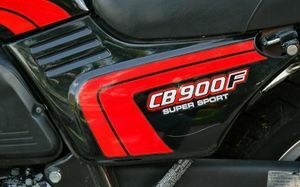 A 599 cc (36.5 cu in) carbureted version called the CB600F exists. The US models can not use the Hornet moniker due to the name being trademarked by the American. 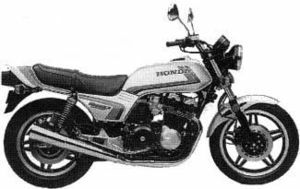 A 750cc and 1100cc version of the CB900 were also sold by Honda, both of which are increasingly rare. 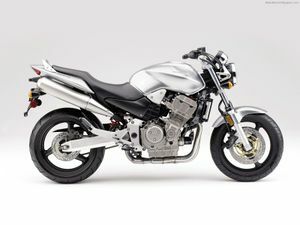 The 2000-2006 Honda CB900F, also called the Hornet in Europe or the 919 in the United States, is a motorcycle powered by a liquid-cooled, fuel-injected 919cc in-line 4-stroke 4-cylinder DOHC engine that produces just over 100 horsepower (75kW) and weighs 427lb (194kg) dry. 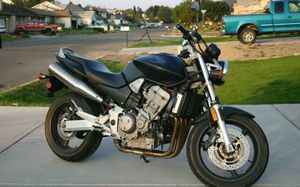 The bike has a six-speed transmission. 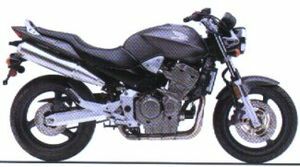 Its suspension consists of a front cartridge fork (adjustable beginning in 2004) and a rear single shock. Its brakes are dual-disc in the front and single-disc in the rear. The rake is 25°, trail is 98mm, wheelbase is 1460.5mm, and seat height is 800.1mm. 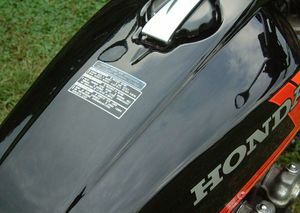 The engine is based on the unit from the Honda CBR900RR. 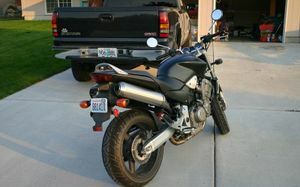 As a sport-oriented Motorcycle that provides an upright riding position and lacks a fairing, it is considered a standard or "naked bike". 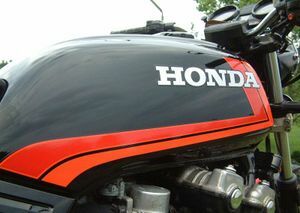 Honda have had a CB900 model since 1981. 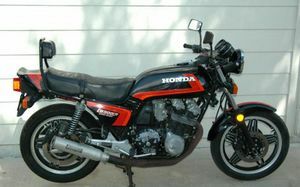 Related is a 599cc carburetted version called the CB600F (Hornet). 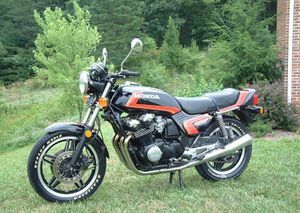 The CB900F'81 900 Super Sport was sold in 1981 in one of two colors: Black or Pleiades Silver Metallic. 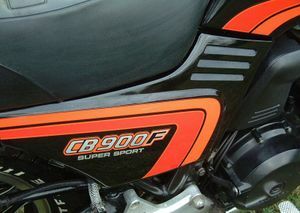 The stripes on the black bike were orange and red; but on the silver bike they were dark blue and light blue. The exhaust was a 4-into-2. 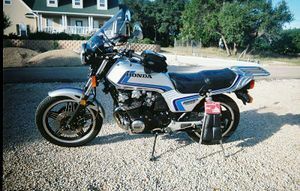 The engine was a 902cc DOHC 4-valve inline 4 cylinder linked to a 5-speed transmission and chain drive. The serial number began JH2SC010*BM000011. 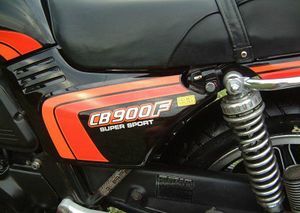 The CB900F'82 900 Super Sport was sold in 1982 in one of two colors: Black(with orange and red stripes) or Pleiades Silver Metallic(with black and blue stripes). The exhaust was a 4-into-2. 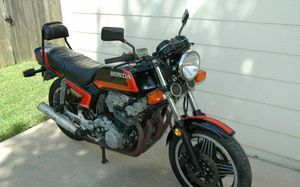 The engine was a 902cc DOHC 4-valve inline 4 cylinder linked to a 5-speed transmission and chain drive. The serial number began JH2SC010*CM100003. This page was last edited on 20 January 2011, at 23:27.